The Union Cemetery of the Methodist Protestant churches of Manhattan and Brooklyn was founded in 1851 on 10 acres of land near the Queens county line in Bushwick, Brooklyn. The cemetery’s name was derived from the union of the Grand Street Methodist Protestant Church of Williamsburg and the Attorney Street Methodist Protestant Church of Manhattan in ownership and administration of the burial ground. The Union Cemetery in Bushwick was the second cemetery jointly held by the two congregations. The first Union Cemetery, which was used from about 1844 to 1851, was a two-acre graveyard situated a few blocks from the Grand Street church in Williamsburg; the remains from that site where relocated to the new cemetery in 1852. 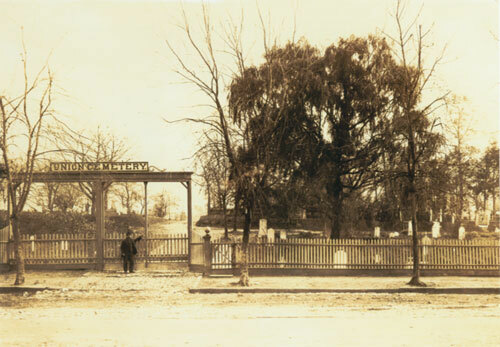 The Union Cemetery in Bushwick was used as a burial ground for the two small churches but family plots and single graves where also sold to the general public. By the 1860s, Union Cemetery was interring about 1,500 individuals annually. 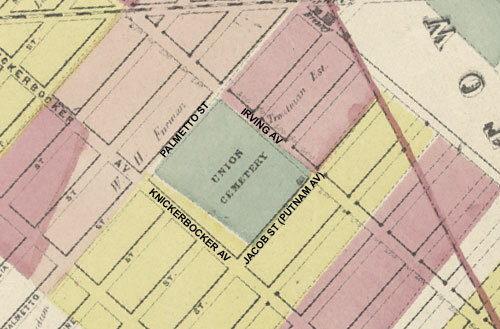 In 1893, claiming that the cemetery was full and that the City of Brooklyn was threatening to cut streets through the property, the trustees of Trinity Methodist Protestant Church of Williamsburg (which formed from the merger of the Attorney Street and Grand Street congregations in the 1880s) announced plans to sell Union Cemetery and remove the remains from the site. A number of lot owners protested the action and obtained a temporary injunction against the sale. After four years of litigation, the state Supreme Court upheld the trustees’ right to dispose of the property and it was sold to merchant Henry Batterman, who proposed to subdivide it into building lots. 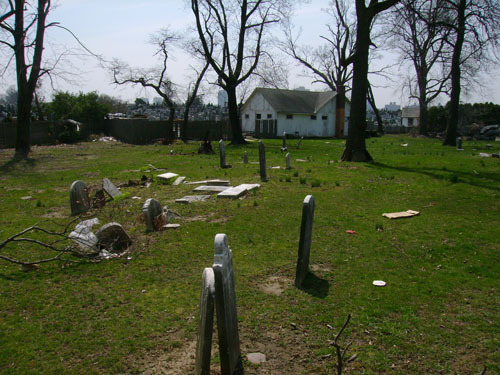 Grounds at Cedar Grove Cemetery in Queens were acquired for reinterment of the remains from Union Cemetery. Between December 1897 and January 1898, remains of an estimated 30,000 individuals were transferred to the new Union burial grounds at Cedar Grove. The transfer was reportedly undertaken with great care—a single box was used for the contents of each grave, with the intention that each be reinterred in a plot or lot of the same size from which it was removed and in corresponding order along with any associated monuments. At the end of the removal of the graves from Union Cemetery, the Brooklyn Daily Eagle reported that the site had “the appearance of a battlefield, where a terrible struggle has taken place.” Despite the lengthy fight to sell the property, the Union Cemetery site remained undeveloped and the ground was left with open, empty gravesites for a decade after the remains were removed. 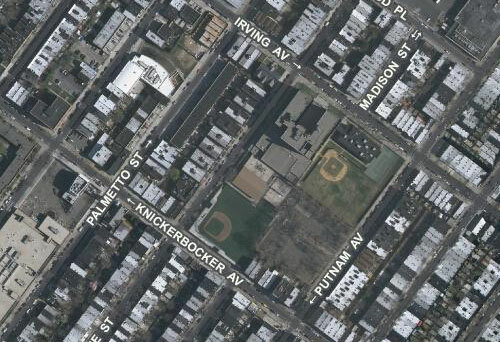 In 1907, the city purchased much of the property and subsequently erected Bushwick High School and Bushwick Playground there. The rest of the site was built over with residences. A present-day view of the former Union Cemetery site (NYCityMap). Sources: Methodist Protestants and the Union Cemeteries of Brooklyn (1844-1894) (Biebel 2007); “The Homes of the Dead,” New York Times March 30,1866; “Old Burying Ground Sold,” New York Times May 4, 1893; “Trouble of the Cemetery,” New York Times June 6, 1893; “Old Union Cemetery Sold,” New York Times Dec 5, 1897; “Old Graves Laid Open,” Brooklyn Daily Eagle Dec 13, 1897; “Removing the Bodies,” Brooklyn Daily Eagle Dec 27, 1897; “Twenty Thousand Bodies,” Brooklyn Daily Eagle Jan 18, 1898; “Graves with Many Bodies,” Brooklyn Daily Eagle Jan 27, 1898;“Want Old Burial Ground for Park,” Brooklyn Standard Union, Nov 6, 1906; “Playground and School on Old Union Cemetery Site,” Brooklyn Standard Union, May 12, 1907; Dripps’ 1869 Map of the City of Brooklyn; Bromley’s 1907-08 Atlas of the Borough of Brooklyn; NYCityMap. NY GEN> & Biographical Society published a CD on the MP cemeteries of some 1,100 pages quite a number of years ago; it was my work. If interested, contact them.